Every other year, my little family and I spend the Christmas holidays in Texas with The Boy's family. Those years are super fun because we're not stressing about travel and my mother-in-law throws one FABULOUS Christmas Eve party. Tons of people show up and there's always lots of food, music, and talking. 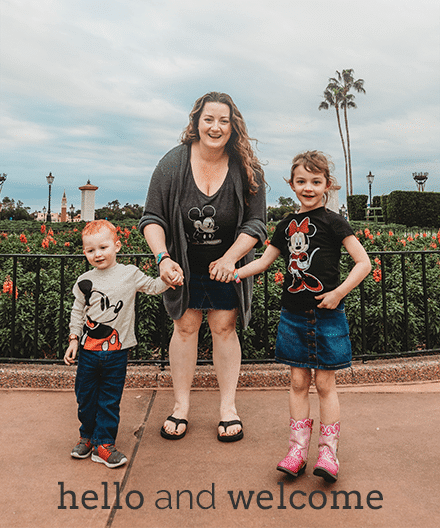 The dress code is nice but casual so this year, I thought I'd toss the littles in some cute jeans and make adorable graphic tops for them with my Cricut Explore Air. 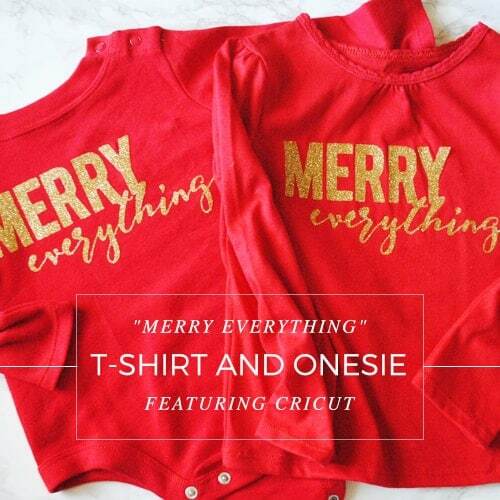 Check out this “Merry Everything” graphic T-shirt and onesie (featuring Cricut)! 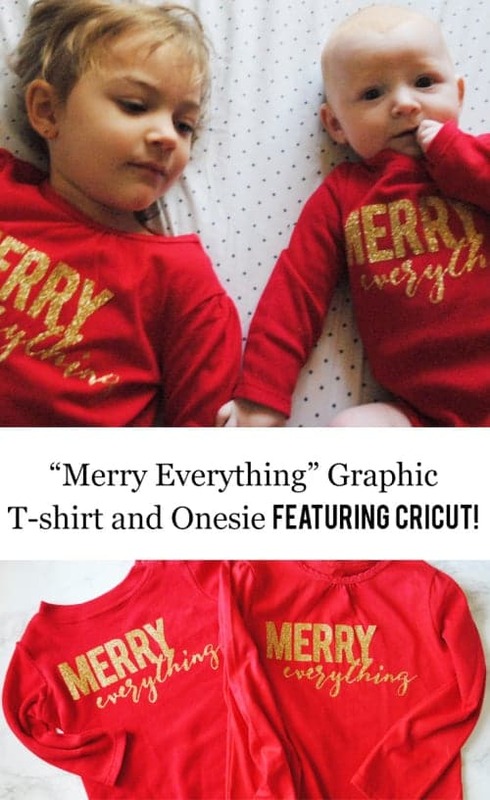 Step One: Download the free “Merry Everything” graphic to your computer onto your computer and then upload it to Cricut Design Space. Step Three: Turn the knob on your Cricut Explore Air to “Iron-On”. Big Fat Tip: While just using the “Iron-On” selection on the knob worked for me, others recommend that you choose Custom and then select iron-on glitter within Design Space. Step Four: Cut the Glitter Iron-On to the necessary size and read the direction on the packaging CAREFULLY to figure out how to apply it to the Cricut Mat properly. It's really, really important to apply the material with the fabric/clear liner down on your mat. Step Five: Load the Cricut Mat into the Cricut Explore Air. Select Mirror Image in the Design Space and then press Go. Step Six: Watch the Cricut Explore Air cut out the “Merry Everything” graphic – it's SO AWESOME! Step Seven: Once the cutting is complete, remove the iron-on from the Cricut Mat. Then use the Cricut Weeding Tool to peel the negative space pieces off the “Merry Everything” graphic. 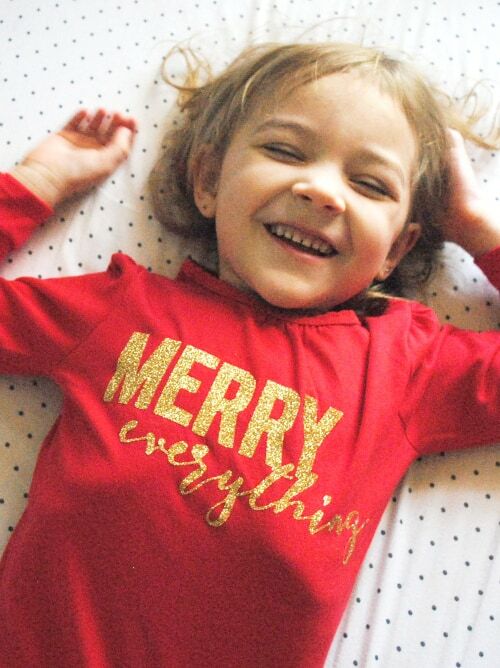 Step Eight: Place the “Merry Everything” graphic on the tee or onesie (remember that since you had it cut out as a mirror image, that it will now be placed on the T-shirt or onesie with the graphic the right way). Use an iron to gently press the “Merry Everything” graphic. Peel off the plastic once you're done ironing. 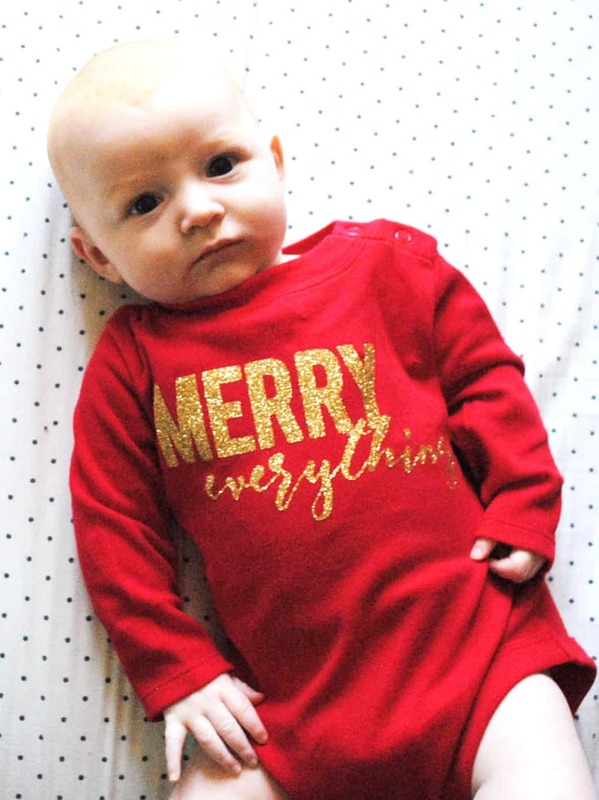 I just love how easy the Cricut Explore Air makes DIYing awesome holiday gear and decor! 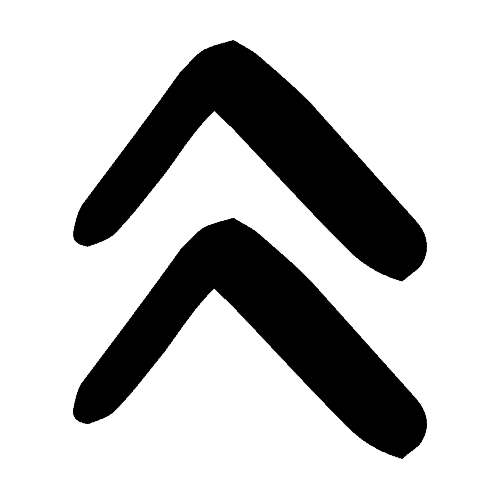 The first time I used it, I was so surprised by the wide variety of products that worked with it. It can cut faux leather, glitter iron-on, and even window clings! I mean, could you have created that T-shirt and onesie in under ten minutes and that easily? I couldn't have and I never would have wanted to with a preschooler and newborn under my feet. 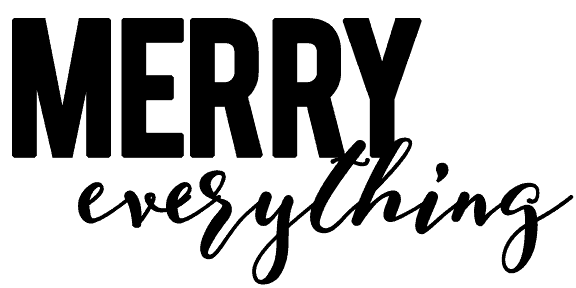 And you don't have to stick to just using my free “Merry Everything” graphic – you can access tons of fonts, graphics, and designs through Cricut Access™ OR upload your own into the Cricut Design Space™. I really love how easy it was to learn to use the Cricut Explore Air – I feel like I got comfortable designing and creating projects in just a few hours. Now I make magnets, window clings, and tote bags! What will you make with yours? 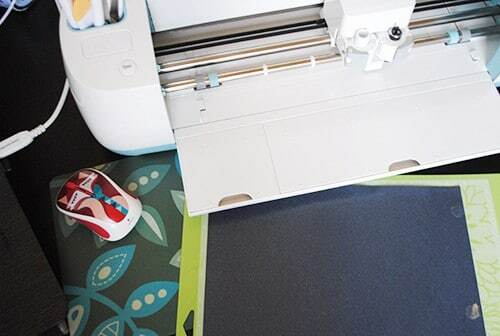 Be sure to share your fashionable Cricut projects on social media tagging @OfficialCricut and #Cricut.